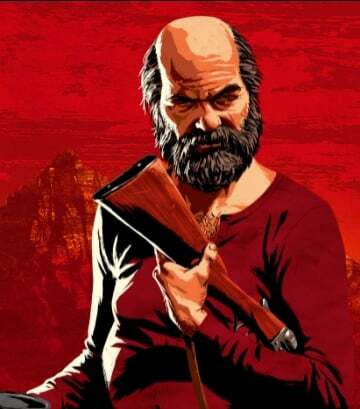 Uncle is a Supporting Character in Red Dead Redemption 2. Uncle doesn’t like working, but claims that it doesn’t make him lazy and that both things are independent from the other; this should give you an idea of type of person he is. A funny drunk that is a trusted companion of John Marston’s and his family. He is also sort of a member of the Van Der Linde Gang, as he's viewed as incompetent due to his alcoholism and poor work ethic, by Dutch Van Der Linde, however entertaining enough to keep around. All that is known about Uncle’s early life is that he used to be a petty thief. It is unclear when he first had a run in with John Marston, but given both their crime-filled resumes, it’s not impossible that it was in a jail cell. Uncle is seen hanging with the Van Der Linde Gang, it’s unclear if he’s a member himself. After a botched robbery in 06 left John Marston close to death, the Marstons escaped the gang in an effort to leave the life behind, and employed Uncle to work around their new farm. In 1911, after Abigail and Jack return to the farm, they are promptly attacked by Ross Butler and his agency, in an attempt to see off the last of the Van Der Linde Gang. Uncle helps John defend their house from the waves of officers that approach but is ultimately shot in the chest for his troubles and tells John to get his family out safely before bleeding out on the porch.